I met Arturo when the conference in Cancun was almost over and my co-board director had resolved on visiting the beautiful ruins of Mayan Chichen-Itza, having me along for the adventure. Wherever my colleague had dug our driver out from, Arturo markedly belonged there. I felt falling into the arms of a smoothly running gang around the hotel business. Arturo had been notoriously advertised by the bellboy while I was making my way through the hall, to the extent that I had began envisioning the amount of the transaction for the referral that was being made between the two. I was left in no doubt that my soft mannered companion had been most cruelly subjected to this campaign too. Arturo, a dark mid-thirties Aztec, hardly reaching a height of my shoulder, as with most of the native population in Cancun, and therefore wearing unusually high shoes, had a wide smile of yellow uneven teeth, a few extra pounds, and was as accommodating as an enslaved servant could be. This naturally provoked an extreme gratitude in his fortunate passengers, not merely in returning a behavior. I was struck with the observation that the stretch of his advances, however, did not trigger any abhorrence, as it happens occasionally when accosted by people of tip professions, with the brightest example just suffered through with the bellboy. Arturo rather balanced with ingenious precision on the edge of cheerful impertinence, which disarmed reproof and turned my curiosity on his smarts. I laughed to myself that even his shoes are right on that border of impudence, but still within propriety. But if it wasn’t merely for that perfect balance, my anticipations were excited by the fellow’s irresistible mix of dignity, self-composure and the usual tricks for American tourists for a behind-their-backs stream of revenue from the venues he takes them to, with an adorable purity and naivety. His inviting openness spared the feeling so common in travelers to exotic destinations of not only being fooled by paying an excess for the local services, but being disdained for falling for those primitively designed tricks. - Cancun is a paradise! 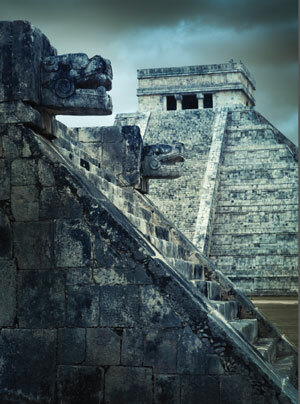 - Well, the meaning of “Cancun” in Mayan is: “can” for snake, “cun” for nest! - Cancun lays inbetween a lagoon and the Caribbean. In the lagoon we have crocodiles; once I saw one that was six meters long. In nearby restaurants they sell a raw chicken for $20 that you can throw them... And they feed cocodrilo with remaining food as they are a tourist attraction. - I suppose, it should be mutual, huh? - Haha, they really come for chickens, not for tourists... Some tourists even jet-ski and waterski in the lagoon. - I wander if a disclosure on the size of beasts is being offered... It is probable however that certain individuals may find enjoyable posing as a live chicken? - On the Caribbean side, sharks are big too. -... usually...?- I had to say it to myself, as Arturo’s joy of sharing was not to be tainted. My companion returned and our conversation, Spanglish and English, diverted to our meal. - What do people do here? - Nothing but occasional tourism here. No business, no farms. People drink. Heavily. In bigger towns youth had sunk deeply into drugs. - Arturo, what is the percentage of population that works for cartels? - About twenty I’d say: bus drivers, bellboys, cashiers-people you meet every day. I caught myself thinking that he makes cartels sound as a household items. - Cartels are not a problem, as when they are not in a war, it’s peaceful here. - What could trigger a war? - Well, it used to be that five big families reigned over the country, but now some small families dare to challenge them and then we have a problem. Yes, Arturo, we got whom you are siding with: your household items. Is this “house holding” what empowers cartels here? Now Arturo stopped for us before a magnificent Catholic church in the town of Valladolid where we drank pimento-spiced chocolate at Marnja, a café across from the town square. In the car, while trying to figure out the most banal tourist’s question of what had happened to those lavish Mayan cities, I opened the book again. It was getting dark, so I switched to pictures of ruins and, to my utter amazement, found that the main ornament element is a snake. - Arturo, is there a lot of worship of snakes in your history? - Snakes? Yes, because we have a lot of very big ones, small, too. While we’re waiting for passengers by the hotel, if we see the right kind, we catch them to sell to a veterinarian later. - Arturo… Do you mean when you got me in your car you might well have had a snake in the trunk?? - Oh yeah, as big as the trunk! - Dear, and what is a right kind? - Poisonous or a big boa. - Also, once I saw three jaguars when I was camping by the airport! I spared myself an analysis if it was beneath myself to allow my amazement to be taken for rapture. We moved through the jungle by dark. I might have expected a jaguar to tear along the two-lane road, imagining its gleaming eyes flitting away instead of the headlights of a few sparse cars, none new. I began to realize that in his purity Arturo honestly considers this wild life’s penetration being an immense attraction: how could a beauty of nature untrimmed not entrance? And how do the people of other places bear the deprivation? - Isn’t it a beautiful town? And so very safe: you see armed military everywhere, right? - Arturo, how many people immigrate from this paradise to the North? - ... mmmh... dunno really: 80-90%? - And how many illegally? - Oh, I haven’t yet heard of someone moving up there legally. My relations went on a tourist visa and overstayed. - Have you ever considered moving? - Oh no, I like it here in Cancun: it is a place of great opportunities for my kids. The joy spread over his face, notably given by a consideration of those bright prospects for kids. - Have you been any place else, dear? - Nope, never been outside Mexico. I hugged Arturo in the airport. It amazes me every time how you can find very happy people anywhere you go. And it is probable that the city I was heading to has less to offer in these terms than Arturo has.